What are the consignment terms? Upon sale of item, Redefine Design and Consignor will split 50/50. If the sells for $1,000 or more, the split is Consignor 60% and Redefine Design 40%. What items will Redefine Design on the Avenue consign? Designer quality and luxury home furnishings; new and gently used furniture; antiques and unique treasures; complete sets (four or more place-settings) of china/dishes; fine art and sculptures; fashionable collectibles; decorative accessories; carpets; lamps; clocks; mirrors; in-season outdoor furniture and decor; rare artifacts and other high quality items for the home. All items must be clean and polished, ready for sale. 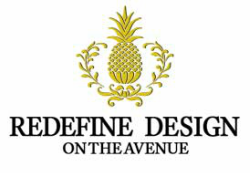 What items will not be accepted by Redefine Design on the Avenue? We do not accept items with stains, odors, tears, animal hair or with water stains or scratches on surfaces. Should I bring my items in for approval? No. We must approve all items for consignment BEFORE you bring them in. You may email a photo of your item(s) or bring photos during our business hours (10 am-6 pm EST, Monday-Saturday; 12 pm-5 pm EST on Sunday). Once items are approved, we will set up an appointment day and time for you to bring selected items to store. We can recommend a moving company to pick up furniture for consignment. Please call 502 894 3489 for more information. Do you ever discount consigned items? Redefine Design will keep items for 120 days. Items will be discounted 10% every 30 days. After the 120 days, it is to our discretion to extend the consignment, offer a special sale or donate. How is the retail price determined? Members of our team determine a reasonable retail price for consigning your item(s). How will I know if my items have sold? After your items sell, Redefine Design will mail you a check (on the 28th day of the following month), less a check processing fee of $1 per month. You must have a balance over $10.00 in order to receive a check. What happens if my items do not sell? Redefine Design will keep items for 120 days, after which it is to our discretion to extend the consignment, offer a special sale or donate to charity. Consignor may pick up unsold items prior to discounted sale period; please give Redefine Design 48 hours notice to gather your items. What happens if I want to cancel my contract? Consignor retains the option to pickup unsold items at any time and cancel contract. Please give Redefine Design 48 hours notice to gather your items. Consignor is responsible for bringing help to lift and load.